A wet tile saw is an important building tool if you are applying tile to a large area. If you are tiling an entire room, it is possible that an entire row of tiles will need to be cut. In these cases, using a manual tile cutter would be tedious, so it is best to use a wet tile saw. A wet tile saw uses water to lubricate the rotary blade and the tile for a clean cut. A wet tile saw is an important building tool if you are applying tile to a large area. If you are tiling an entire room, it is possible that an entire row of tiles will need to be cut. In these cases, using a manual tile cutter would be tedious, so it is best to use a wet tile saw. 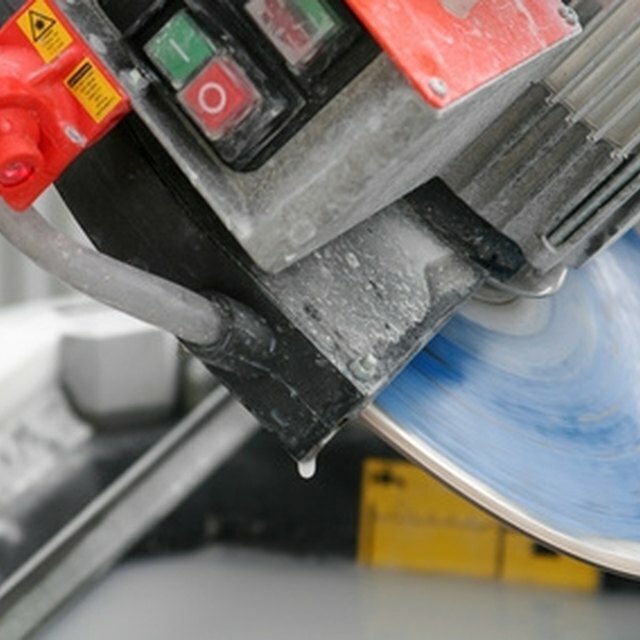 A wet tile saw works by spraying a jet of water on the diamond-tipped rotary blade, as well as the tile. This cools down and lubricates the tile, which prevents breaks. Add water if the water reservoir is low. Mark the back of the tile you'll cut, using a permanent marker and rule. A permanent marker is important, since a wet tile saw uses a jet of water to lubricate the tile, and may erase a non-permanent mark. Align the end of the mark with the carriage marker on the wet saw. Turn the wet tile saw on. This will start the diamond-tipped rotary blade spinning, as well as a jet of water. Push the tile slowly into the blade, following the permanent marker line. Mark the line of the desired angle on the back of the tile with a permanent marker if you are making a corner cut. Cut into one end, turn the tile and cut into the other end, meeting in the middle. Snap the piece off and clean any rough edges with sandpaper. Maintain your wet tile saw by checking the pond regularly. This is the area that the water falls into before being recycled. Keeping this area clear of debris will help prevent clogs. Always read all instructions before operating a new power tool. Wear safety gloves, goggles and long sleeves anytime you are cutting tiles. Sofia Rodrigues has been writing professionally for six years and has worked for various print and online magazines, including "Make" and Guttersnipe. Her field of expertise ranges from early childhood development to sports and comedy writing. She studied semiotics and English at the University of Toronto.